Welcome to Cats Away - my small contribution to the big wide web dedicated to helping fellow gardeners, garden lovers and garden bird lovers keep cats out of their gardens. I make no apologies for this website - you may well be a cat lover and I neither ask nor expect an apology from you so please pay me the same courtesy. There are estimated to be over 9 million cats in the UK and between them they kill 275 million small mammals and birds each and every year. Cats Away hopes to help gardeners deter cats from stalking, spraying, pooping and digging in their garden. All cat deterrents and repellents described or reviewed are in no way harmful to cats and Bob does not condone methods which may hurt a cat or any other animal. 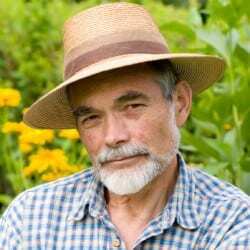 Bob Taylor is a retired engineer and now spends his time writing this blog, gardening and reading. For some time now it has been considered bad form to allow your dog to roam free to do its business on the neighbours front lawn or back yard yet apparently it is still fine to throw out the cat every day to let him go poop in next doors flower beds, dig up their plants and stalk the wildlife feeding at their bird table. Now I should point out that like most people I do like cats, I just happen to like gardening a whole lot more and as any gardener the world over will tell you, finding the seedlings you lovingly raised and planted out have been dug up by a local moggie will drive you to despair. I am surrounded by cats. Both neighbours have them and our garden backs onto another property who’s owner also has one, so that’s left, right and bottom. Add all the other cats who live nearby and as you can imagine, I have a constant fight on my hands to keep my flower beds cat poop free. Although a keen gardener all my adult life it was only when we retired to the suburbs that I started having problems with cats. Whether our move coincided with a cat population boom or not I don’t know. I have read that since tougher laws were passed on dogs and dog poop that cats are now the number 1 pet in the UK and more likely, I simply didn’t notice them so much when I was working and spent less time pottering around in the garden. For example, one of the most popular you will find on gardeners forums is the cat and water bottle myth. A large clear bottle half filled with water strategically placed in their path is supposed to scare cats away because the reflection looking back at them is that of a bigger cat. Of the half dozen cats I witnessed wandering past one of these bottles only 1 seemed mildly concerned with the reflection and that was by no means enough to scare him off. As well as all the various ‘myths’ doing the rounds you will find many commercial cat deterrents available and I have personally spent well over £700 on these gadgets over the last few years – to both test and review for this blog. The effect of these can be very hit and miss and their success depends on whether your garden is suitable for that particular type of deterrent and also on the cats in question – cats are individual critters and what works on one may not on another. Sometimes something would work on the first cat and I would think I had finally won the battle only for the next one to come along and do nothing more than pause and look quizzically at the ultrasonic screeching, flashing device that I had just paid £30 for! So, the best advice I can give is to work through the various methods you can find here, starting with the free cat repellent tips and tricks and see what works and what doesn’t with the particular cats frequenting your garden.